Hola ladies! I was ecstatic when I found out that I was nominated by my fellow beauty bloggers for the Sunshine Award. I am honored that Dawn of Peachy Pink Sisters and Juvy of Plump Cheeks thought of me while doing this tag. If you're already a reader of my blog, you'd know that I rarely share details about my personal life, so I seldom participate in tags like this. 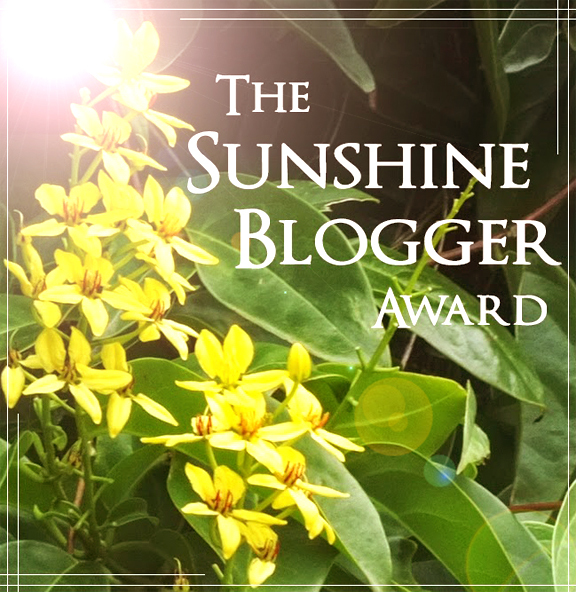 The Sunshine Blogger Award is a way for fellow bloggers to get to know each other through answering their personal questions. I figured, why not? So, I went ahead and joined the bandwagon. 5. I really love watching various US TV Series like, NCIS, Revenge, Blacklist, Arrow, Bones, etc. 7. My favorite color is Mint and Aqua. But when it comes to clothes, I like, white, black and gray. 9. I don't like shopping for clothes coz I rarely find affordable pieces that fit my plus size body. 10. I enjoy playing RPG games on my PS3 super slim. I recently finished playing, Ni no Kuni. 11. I used to sing and play guitar but haven't done that ever since I got married. 3. Do you have a pet? What is the/ir name? Currently, None. 4. Are you a morning or an evening person? I am a morning person. 5. Do you think marriage is important? Yes, definitely. I got married in 2007. 10.What is your motto in life? Live in such a way that if someone spoke badly of you, no one would believe it. 1. Which do you prefer Peanuts or Cashew nuts? 2. Dark Chocolate or Milk Chocolate? 3. Do you prefer Hot or Cold Coffee? 4. What do you do on Sundays? 5. Who's your favorite local news reporter? 6. What's your favorite US TV Series / Drama? 7. What's your favorite brand for Blushers? 8. Where do you shop online? 9. Who's your all time favorite youtuber? 10. Do you exercise at all? 11. What is your favorite meal for breakfast? Yay! :) Thanks for doing it, and I enjoy reading your answers! Take Care always! @peachypinksisters... buy me some clothes too! LOL I really don't have the patience to look for clothes that fit me from rack to rack. Most the time, I always go to sections in malls that carries overruns, coz I'm sure I can find my size there and it's super affordable. Congrats + thanks for the nomination! Oh man, I can't imagine how much trouble raising two boys cost ._.' (Even one boy was a ruckus for my mom!) And....I DIDN'T EVEN KNOW NARUTO WAS STILL AIRING LOL. Damn I haven't seen that show in forever! Man, I'm starting to think you watch more TV than me. Quite a feat! @Vanessa, oh man, you have no idea. That's the reason I recently stopped posting Beauty Hauls, coz I just can't afford to haul anymore. Baby's milk is super duper expensive and I'd have to buy every 10 days for 1,500 pesos worth of milk. Yeah, my brother used to play guitar--not sure if even he remembers the chords!